Hard work pays off as women’s basketball begins Scenic West Athletic Conference with two wins. During their first games of conference play, Utah State University Eastern defeated Colorado Northwestern Community College Spartans on Saturday, Jan. 5 and College of Southern Idaho Golden Eagles Saturday, Jan. 12. After two months on the road, Eastern came home to open the season with an 88-60 home game win over the Spartans. Dominating the game early, Eastern went on a 12-0 run within the first minutes of the game. The players are amped up to start playing conference games and are hosting the 2019 Scenic West Athletic Conference tournament this year according to Eastern sophomore Alyssa Crumley. “Everyone was excited to finally play conference play and I think we have a really good chance this year especially with us hosting the tournament,” Crumley said. In the second quarter, the Eagles again brought the heat and outshot the Spartans 26-6. Outscoring the Spartans and giving each player that was dressed for the game minutes on the court, All but one Eagle player scored during the match against the Spartans, furthering the offensive assult. “It was positive all the way around and they shared the ball well tonight. When we share the ball well, it is hard to stop us,” said USU Eastern Head Coach Chelsey Warbuton. With the entire bench getting minutes to play the shot 46.7 percent from the field and 29.2 percent from deep. “I think we shot well as a team because we executed and found the open person,” Warburton said. During the second half, Eastern held their lead and momentum to take the win, though the Spartans outscored the Eagles 24-21 in the fourth quarter. Freshman guard Emmery Wagstaff led the Eagles in scoring, with 17 points and six rebounds. Coming off the bench freshmen Noah Harris and Lamija Coric added a combined 15 points and eight rebounds in the victory. With freshman after freshman coming off the bench to make an impact after impact for the Eagles, Crumley believes the freshmen are ready to contribute in the upcoming conference season. “I think they all have transitioned great into college ball and I don’t think I can consider them freshman anymore,” Crumley said. With 14 points, nine rebounds and three assists Crumley led the team-high in rebounds. “She is very hard to stop inside and outside. Tonight she had a complete game for us,” Warburton said. With energy flowing at the introduction of the game, as the ball was tipped right down to the final buzzer, Eastern allowed CSI to take a three point lead once. Eastern soared in the second quarter after five three pointers were made from deep. The team controlled the game with their rebounds and defense, holding a four point lead before halftime. During practice this week, the coaches and players focused on transitions and rebounds to ensure a win against CSI. “Our coaches told us this week that rebounding and transition would be key to getting the win,” Freshman Morgan Toluono said. Eastern reached up 15 rebounds in the fourth quarter as a team; Toluono with 12 boards against CSI. Toluono also had three assists and 16 points. Eastern forward Harley Carlisle acknowledged her teammates efforts and the energy she shows on the court. “Morgan brings a lot to the table in every game especially her energy and that showed tonight,” Carlisle said. With six minutes remaining in the game, Eastern held a 17-point lead which was the biggest lead of the game. CSI fought till the end and attempted to earn quick points and make a comeback. “They wanted the quick points, but we had to control the ball and run the clock like what our coaches told us to do,” Toluono said. Eastern accomplished their goal and beat CSI, starting the conference season 2-0. Preparing hard and knowing their coaches believed in them, helped the team focus during Saturday’s game versus CSI according to Carlisle. “We were focused all week on CSI and we prepared hard and our coaches believed in us,” Carlisle said. Wagstaff led on Saturday with 19 points. Following Wagstaff, Crumley put up 15 points and eight rebounds. 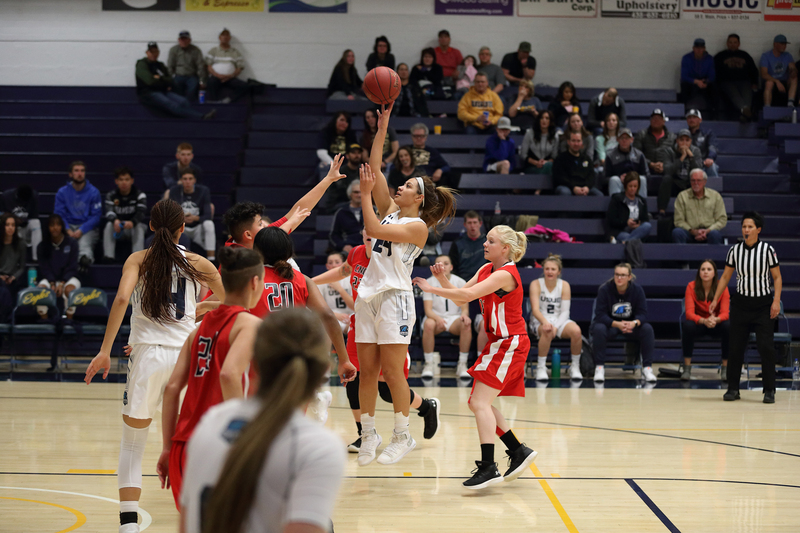 The team will hit the road to take on nationally-ranked Salt Lake Community College on Thursday, Jan. 17, 2019 at 5:30 p.m. in Taylorsville. 0Hard work pays off as women’s basketball begins Scenic West Athletic Conference with two wins.